A week after I got to Georgia as a Kiva fellow in the field, I received an email from Giorgie, one of the guys I had contacted when looking for a place to stay in Tbilisi. He asked if I was interested in coming to his parents’ village to help pick grapes over the weekend. Of course I was! I knew an adventure was afoot. 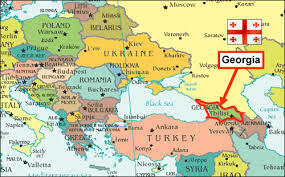 For context, Georgia is a former soviet republic located in the Caucasus, the region between the Black Sea and the Caspian Sea. Georgia has been struggling to transistion to a market economy after the soviet break up, and you can help them by clicking here and backing much-needed loans. Giorgie picked me up Saturday night and we drove to the village so that we could be up bright and early to work on Sunday. In the morning, after a 15-minute drive in a 30-year-old soviet Lada car, we arrived at the grapes. They had about a dozen rows, each about 100 paces long. As we were admiring and sampling the grapes, breakfast was being served. 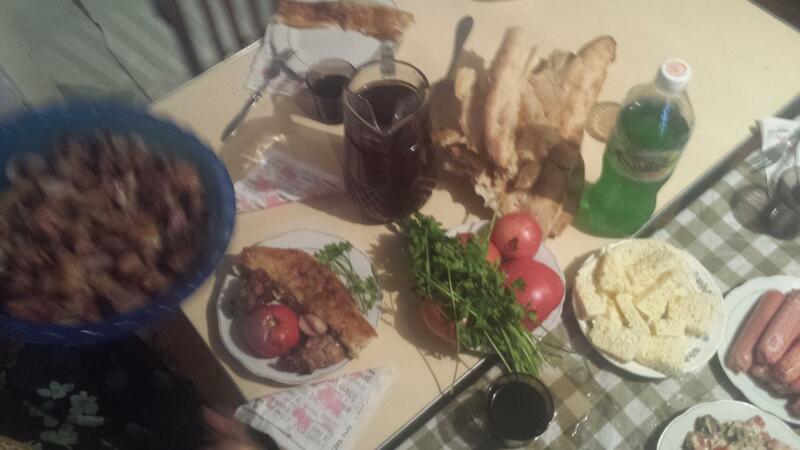 Seemingly out of nowhere, Giorgi’s mother had produced a breakfast feast and laid it on a sheet on the ground. There was fresh bread, cheese, a whole chicken with homemade garlic sauce, sausages, tomatoes and a fantastic creamy eggplant salad. What was missing? Well vodka, of course! Giorgi’s dad produced a bottle of homemade fire water (called chacha) and insisted we have at least one shot during breakfast. Not only have I never had vodka with breakfast before, but it was the strongest stuff I’ve ever had. With the food and drink, my mood had improved significantly! Then, the hard part started. We took knives and cut off each bunch of grapes and put them in our buckets, starting in the middle of the rows and moving back down towards the truck that held our grapes. After I had been working for what seemed like forever, I took a break to get some water and stretch my weary muscles. When I checked the time, I found it had only been an hour and twenty minutes. Oh no! It was going to be a long day. We worked hard for another 3 hours before we finished our rows and Giorgie told us to pack our buckets into the truck. I was elated as I was so tired I didn’t think I could go on much longer. We got in the vehicles, and they promptly drove to the other end of the grape rows. We were only getting ready for the second half! Arrrgghhh! I was in trouble. Then, as I was starting work again, an amazing thing happened. It actually started getting easier! During the day we had all become better acquainted, and by the afternoon we were trading stories about our backgrounds and travels. We joked and laughed and began to forget about the exhaustion. The second half seemed to take half as long as the first. It’s amazing how relative time becomes, and it shows the power of camaraderie to make life easier. After we left the field, Giorgie’s father started a bonfire to get the coals ready for the shashlik, or barbeque. It was difficult to smell the delicious chicken sizzle with such an appetite, but soon it was dinner time. And of course, it was another feast - everything from the morning's breakfast with the addition of the perfectly grilled chicken. And wine. Lots and lots of homemade wine. The grapes we picked that day were mostly sold to other vintners. 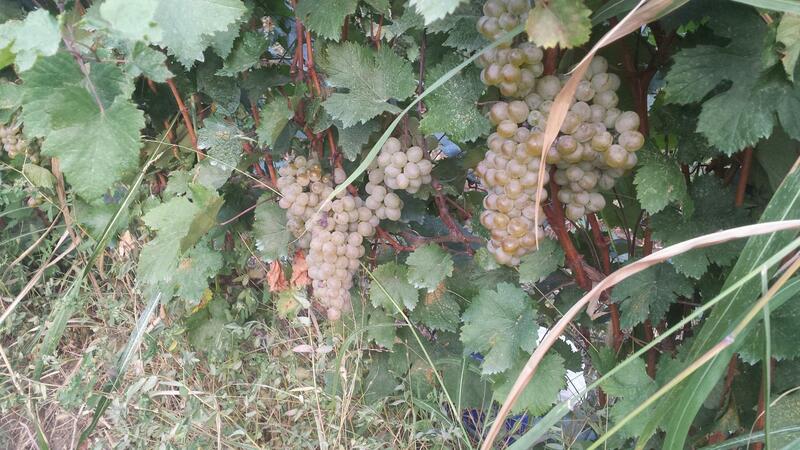 We picked enough to make over 2,000 liters of wine! However, enough of the grapes are kept to make homemade wine for the year. Talk about win-win. That night I didn’t get home until midnight, but I couldn’t have been happier about getting the chance to experience authentic Georgian country life and take part in a tradition that goes back thousands of years. I can’t imagine a better international experience. Over the last few weeks, I have been working with the good people at Credo bank. 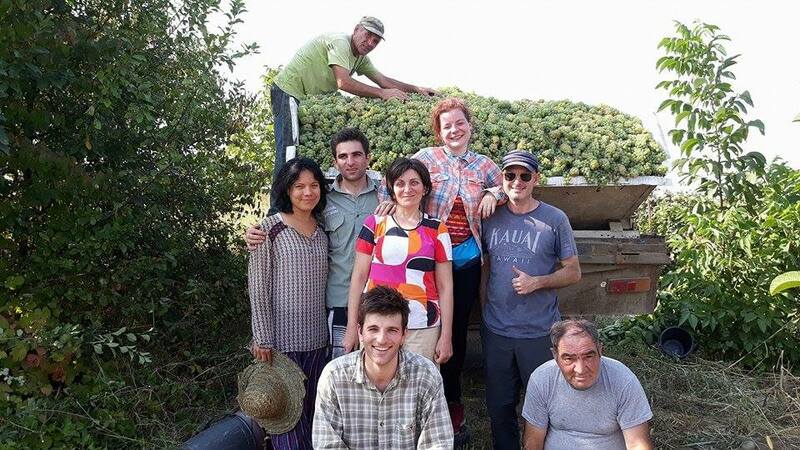 While there, I have observed the same hard work and team building that I experienced while picking grapes. They are determined to provide high-quality loans to the underserved community of lenders in Georgia. You can support their efforts to allieviete poverty by visitng the Credo lending page here. The citizens of Georgia will be grateful for your support. Kevin was born in the U.S. in Missouri. He pursued his undergraduate education at Georgetown University, majoring in Finance in Accounting. At Georgetown he was active in AIESEC, an organization dedicated to peace and positive impact through personal development and shared global experiences. 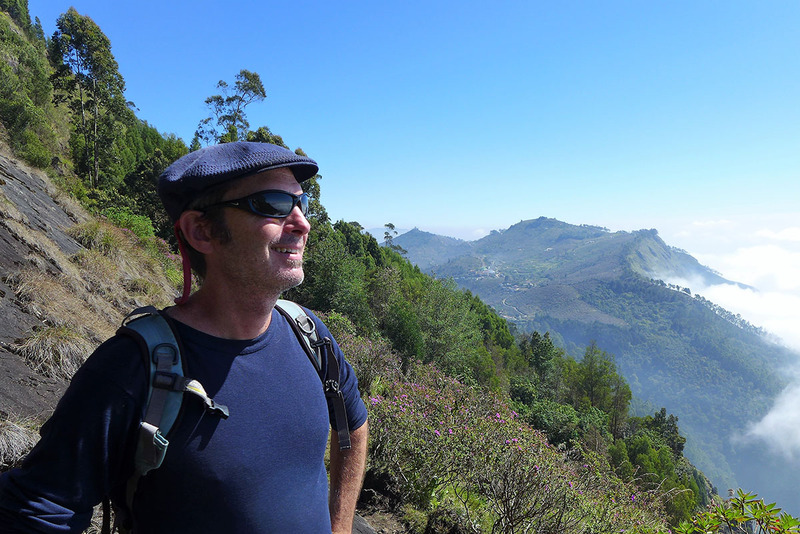 He obtained his CPA certification while working in New York and promptly decided to travel around the world for two years, living mainly in developing countries. Upon moving to California, he worked in accounting, financial audit, and internal controls, with assignments that frequently involved international travel. Having learned about microfinance at Georgetown, Kevin has always been intrigued by the concept and finally decided to enter the field. In order to obtain lending experience, Kevin worked for four years as the Quality Assurance Manager at an independent mortgage company in San Diego. When he learned about the Kiva Fellowship, he knew it was the perfect opportunity to put his past skills and experience to work. His ultimate goal is to combine his love of business, travel, cultural experiences, and social entrepreneurship into a lasting and meaningful career.